As part of Early Music Month and Play the Recorder Month, the School of Music, Theatre, and Dance at Kansas State University will host the 2nd annual K-State Recorder Workshop for student and professional music educators, recorder players and enthusiasts, early music fans, and more. The date and location of of this year’s Workshop is Saturday, March 30, 2018, 9:00am-4:00pm in Room 105 of McCain Auditorium (1501 Goldstein Circle, Manhattan, KS). The Workshop is open to anyone 13 years or older. Previous recorder experience is beneficial, but not required. Participants must provide their own instrument. There will be no registration or payment accepted on-site at this year’s Workshop. Registration is FREE for all students of Kansas State University enrolled for the Spring 2018 semester along with non-student members of the K-State Collegium Musicum. Cash payment of registration fees is possible by visiting the School of Music, Theatre, and Dance Office in Room 109 of McCain Auditorium, Monday-Friday, 9am-12pm or 1-5pm. Payment by credit card is not available. After great feedback from last year, we will offer two separate technique tracks during the morning – one for Beginner to Advanced Beginner players and a second for Intermediate to Advanced players. The afternoon session will focus on large-group playing for all workshop participants. You may refer to the Berlin/Blaker Self-Rating chart (http://tibiaduo.com/wp-content/pdf/self_rating.pdf) if you have any doubt about the level of your playing ability. Anne Timberlake (annetimberlake.com) has appeared across the United States performing repertoire from Bach to twenty-first-century premieres to Celtic tunes and holds degrees in recorder performance from Oberlin Conservatory and Indiana University. She has coached through Indiana University’s Pre-College Recorder Program and at the Amherst Early Music Festival, the San Francisco Early Music Society, the Virginia Baroque Performance Institute, Mountain Collegium, Columbia Gorge Early Music Retreat, and numerous other workshops along with American Recorder Society chapters. She maintains a private studio out of St. Louis, MO, where she also leads a large-group playing session through the local chapter of the American Recorder Society. Vincent Lauzer will perform at 7:00pm EDT on Thursday, May 23, 2019 at First Presbyterian Church, Bloomington, as part of the Early Music America’s Emerging Artists Showcase, as part of the Bloomington Early Music Festival. 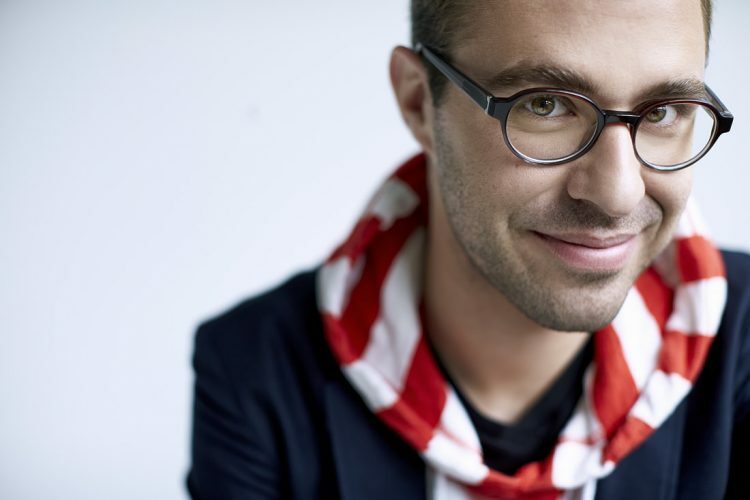 Révélation Radio-Canada 2013-2014 and Breakthrough Artist of the Year (2012 Opus Awards), Vincent Lauzer graduated from McGill University where he studied with Matthias Maute. He is the artistic director of the Lamèque International Baroque Music Festival in New-Brunswick. Winner of several prizes, he has recently been awarded the Fernand Lindsay Career Award, a scholarship given to a young promising Canadian musician for the development of an international career. In 2012, he won the First Prize at the Stepping Stone of the Canadian Music Competition and the Career Development Award from the Women’s Musical Club of Toronto. As both a soloist and a chamber musician, Vincent has participated in several recordings that have received critical acclaim. He is a member of Flûte Alors! and Les Songes, two ensembles with whom he has toured Eastern Canada with Jeunesses Musicales Canada. Vincent performs as a soloist with Arion Baroque Orchestra, La Bande Montréal Baroque, the Pacific Baroque Orchestra and Les Violons du Roy. 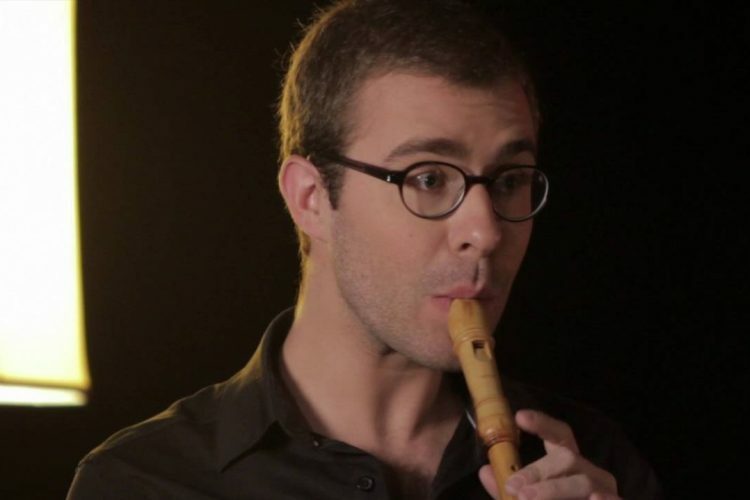 In this program, Vincent Lauzer performs works from the Baroque era for solo recorder. This concert features virtuosic excerpts from Jacob van Eyck’s Der Fluyten Lust-hof, inspired fantasias by Telemann and a transcription of J.S. Bach’s famous Partita for Solo Flute. Lauzer also offers his own transcriptions of Tartini’s Variations on a Gavotte by Corelli and of J.S. Bach’s second cello suite. With 10 instruments with him on stage, Vincent Lauzer hopes to make you rediscover the recorder in a new light. 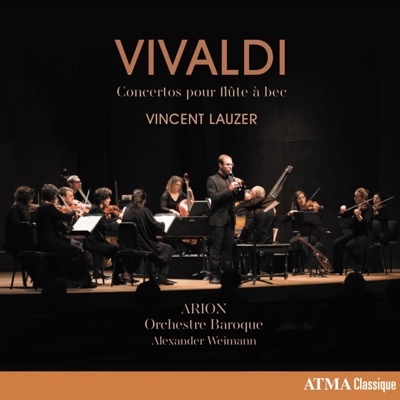 Vincent Lauzer plays many Vivaldi recorder concertos on his new disc with Arion Baroque Orchestra. Discs like this one give the lie to the idea that Vivaldi rewrote the same concerto several hundred times (or whatever Stravinsky supposedly said about him). The rich low strings opening up RV 312R’s central movement, the harmonic zig-zags of RV 441’s finale, the downright jarring dissonances of RV 442’s otherwise placid Largo, or the melody skipping over a glassy lake of strings in RV 443’s second movement are far from cookie-cutter devices. 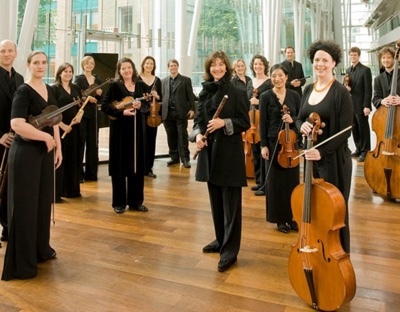 Vivaldi’s highly-structured, often virtuosic, and incredibly expansive catalog of works may sometimes blur together, but recorder player Vincent Lauzer and Canada’s Arion Baroque Orchestra illuminate its formal as well as its expressive variety. Violist Jacques-André Houle’s liner notes explain that Vivaldi composed some of the most difficult works for the recorder of the Baroque era. Lauzer meets these demands with precision and polish throughout the recital, but it is obvious that he reads, hears, and feels through the racing arpeggios and stacked sequences into something deeply personal. From the first track on, he makes a real event out of Vivaldi’s ornate passages with subtle changes of articulation and rhythmic drive. The closing Allegro of RV 445 is a prime example of Lauzer handling even the most labyrinthine lines with care and attention to detail. His metronomic precision actually turns the rapid-fire chirps of RV 312 R’s finale into a riveting account rather than a mechanical exercise. Lauzer’s tone on alto, soprano, and sopranino recorders is centered, full-bodied, and often beautifully vibrato-less. The contrast between Lauzer’s big, round sound and Arion’s drier strings on the opening Allegro Ma Non Tanto of RV 441 adds further textural as well as narrative interest. RV 441 turns into a miniature scena, recalling the composer’s lengthy theatrical catalog: Opening with divided strings wavering over and under the lead, Lauzer begins his solo in introverted fashion before dramatically opening up into sustained notes and descending runs. The subsequent slow movement finds him working with shadings of tone and dynamics. The final movement pits the orchestra and the soloist against one another in a heated dialog. Arion also gets to really lock in with Lauzer in RV 312 R, as well as the duel in RV 441. The well-known La Notte concerto (originally composed for transverse flute) finds soloist and orchestra conjuring up some dreamy, haunted evening with creeping rhythms, muted strings, and staccato outbursts. Arion’s halting gestures and extreme dynamics sometimes come close to exaggeration, yet it is hard to fault these musicians’ obvious passion. The “Sonno” (Slumber) section also features some particularly evocative sustained chords. Most of the time, Arion is accompanying Lauzer rather than competing with him, and while the group never draws undue attention to its part, there is impressive musicianship at work underneath the soloist. Vivaldi would drop the continuo and use upper strings as the sole accompaniment on countless slow movements; Arion’s graceful strings chanting behind the soloist illustrate the sheer simplicity and power of this effect. Vivaldi was often writing his concertos for the orphans of the Ospedale della Pietà in Venice, for human beings he knew and with whom he no doubt developed personal relationships. The idea of a human printing press churning out repetitive works is not just unhistorical but misses the charm and invention of Vivaldi’s music. Lauzer and Arion provide strong advocacy for the Red Priest in their program selection and especially through these performances. Andrew J. Sammut has written about early music and traditional jazz for Early Music America, The Boston Musical Intelligencer, All About Jazz, and his own blog. He lives in Cambridge, MA. Rumore Terribile will perform as part of the Early Music America’s Emerging Artists Showcase, May 24-26, 2018, as part of the Bloomington Early Music Festival. We’ve been playing together for around two years now. 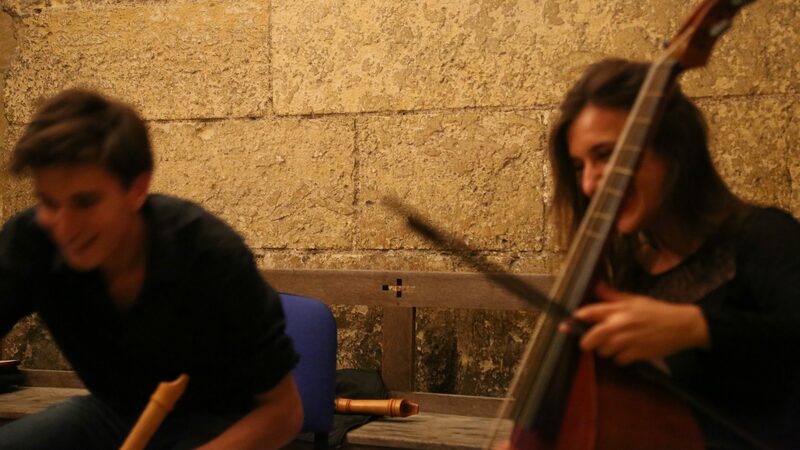 Our first public performance took place in a small alley, in a medieval Italian village. It was shady, and the acoustic was great, so we stopped one hot afternoon to play. The performance was met with critical acclaim: our one audience member leaned out of his window, clearly gripped with emotion, and shouted down at us. “Rumore terribile!” Since then, we’ve continued searching for fun places and good music, for communication and drama and language and power. There’s a lot of it in this music and we hope to share it with you – terrible noises included. When in 1651, the king of England Charles II was forced to flee to France, he made sure to take a few hand-picked English musicians and composers with him – no need of course to leave the splendid entertainments of his home court. Apparently, Rosalind, disguised as a boy, joined up with the troupe as their flutist. In her journal, she records her thoughts about the journey, the men she’s with, and the experience of living in disguise – alongside of course, some of her compositions and arrangements. It’s the perfect starting point for us: music inspired both by English and by the French composers that joined Charles when he reached Versailles; music from and for those wandering between two places, speaking two languages. And it’s music that’s focused on the small ensembles Charles could host, on the intimate communication these musicians shared. We’ll explore music from Rosalind’s journal, and other manuscripts left from Charles’ roving court: that from composers like Tobias Hume, Matthew Locke, Louis Couperin, Sebastien de Brossard, and some perhaps arranged or written by de Bois herself. Maybe we’ll all end up understanding each other. *Rosalind de Bois is a fictional character who disguises herself as a man to escape into the forest in Shakespeare’s “As You Like It”. The journal is our fantasy – to be as poetic and beautiful as possible. Salomé Gasselin began playing the viola da gamba at age eleven, studying first with Julien Léonard. She entered the class of Marianne Muller at the CNSMD Lyon, and worked later with Josh Cheatham, Philippe Pierlot, and Vittorio Ghielmi. She studied literature at University Paris X as well. Gasselin has performed across Europe with many renowned conductors, including Skip Sempé, Patrick Ayrton, and Raphaël Pichon. Her playing has been heard at the world’s leading early music festivals in Bruges, Paris, Utrecht, York, Oslo, Göttingen, Pavia, Lisbon, Sablé, and Ambronay. 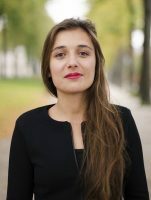 She often works with contemporary composers and playwrights and has taught at Nantes Conservatoire. Currently, she is particularly interested in seeking out and playing lyra viol music of the 17th century. Martin Bernstein has been heard with numerous ensembles across the world, in venues ranging from 17th-century Italian palazzos to modern art museums in Reykjavik to the concert halls of New York City. Bernstein began studying recorder at age five, first with Charles Sibirsky and later with Nina Stern. At 18, he left New York City to study at the Royal Conservatoire of The Hague with Reine-Marie Verhagen and Han Tol. He has won several international competitions and has been featured on NPR. Bernstein teaches privately and at various early music festivals; he currently studies at Harvard University. Dr. Lindsey Macchiarella is a Visiting Assistant Professor of Music at the University of Texas at El Paso. While her musicological research focuses on 20th-century music, she is an avid performer and teacher of early music on the recorder and viola da gamba. 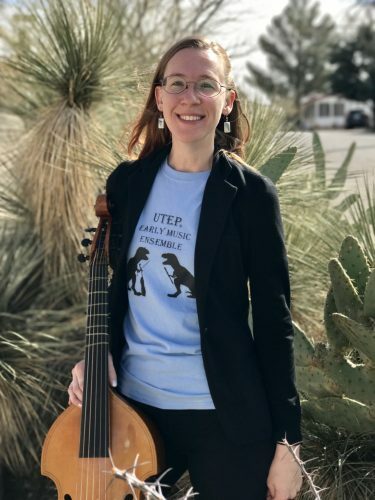 She is the founder and director of the UTEP Early Music Ensemble. How did you come to the field of Early Music? Because I went to a Waldorf school when I was young, the recorder was actually my first main instrument. I played quite a bit of early music very young. I took up the flute in High School and for my undergraduate degree, but when I went to Florida State University for musicology, I quickly discovered the Collegium Musicum and went back to the recorder. Pretty soon, I was the TA for that group and I started organizing concerts on my own so I could pick my own rep! Somehow, I was pressured into filling a gap in the school viola da gamba quartet, and I’ve been obsessed with that instrument ever since. What is your most memorable early music experience from the past year? So, I’ve started putting on early music concerts . . . in bars. The idea is to create a relaxed concert atmosphere and also to reach people who don’t know much about this kind of music. During the UTEP Early Music concert last spring, one such accidental concert-goer sat practically at my feet when I played a Fux viola da gamba trio sonata with my students. Afterwards, he shook my hand vigorously, kissed it (which was a little weird, but he was very excited and meant well), then gave me a play-by-play of his favorite parts of the sonata. He said it was his first time at a classical concert. What is an important piece of advice you give to students just beginning with early music and/or performance practice? You’ve just got to have some people to play with! I always try to convince students to form quartets with others who play at their same level and to make a schedule of weekly meetings. What I enjoy most about early music is the social aspect, and I think you can’t really get seriously started without a sight-reading group of your own. Unexpectedly, you have two hours of free time later today . . . what will you do? Last night, I went to guitar center and bought an acoustic pickup and a looper pedal. I have been counting down the hours until I have a free moment to use it to play Gottfried Finger divisions and Michael East viol duets with myself! It’s going to be so cool.